State funeral committee for Kim Yang Gon (Photo: NK Leadership Watch/Rodong Sinmun/KCNA). Workers’ Party of Korea [WPK] Secretary and Director of the United Front, member of the WPK Political Bureau and senior civilian intelligence manager Kim Yang Gon (Kim Yang-ko’n) died from injuries he suffered during a car crash in Pyongyang at 6:15 AM [NKST] on December 29 (Tuesday). Kim had become a routine member of Kim Jong Un’s (Kim Cho’ng-u’n) entourage during Jong Un’s on-site visits and a close adviser on foreign policy to the Suryo’ng. 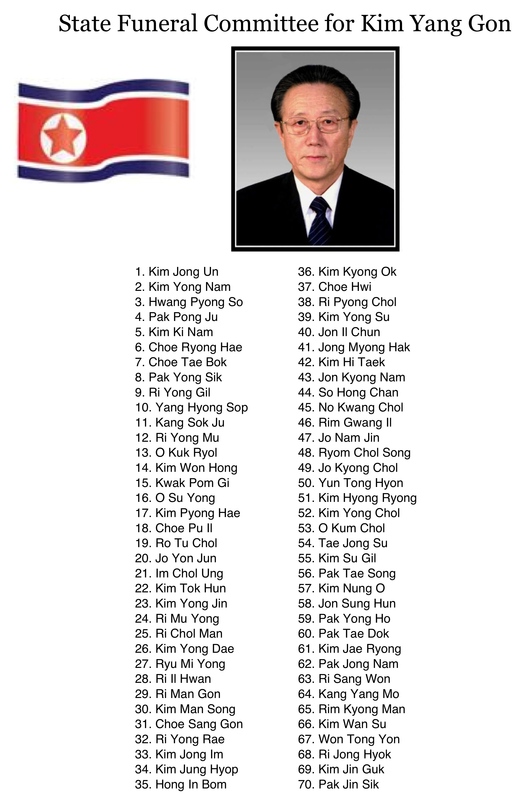 A thorough obituary on Kim Yang Gon will appear on 38 North erelong. 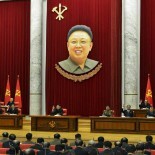 In the mean time DPRK state media announced the members of the state funeral committee (above). A wake and viewing for Mr. Kim will be held at the Sojang Club in central Pyongyang on December 30 (Wednesday) and a state funeral will be held on the morning of December 31 (Thursday). This article was written on 29 Dec 2015, and is filled under Uncategorized.